Use refrigerated dough to make our Sausage Calzone in a snap. 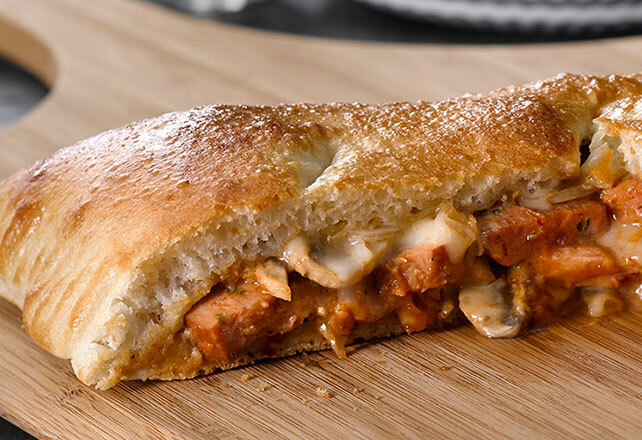 This Sausage Calzone is so easy to make, you'll wonder why you waited so long to try! Unroll pizza dough onto baking sheet sprayed with cooking spray; pat into 12x10-inch rectangle. Cook sausage, onions and mushrooms in large nonstick skillet on medium-high heat 5 min. or until sausage is lightly browned, stirring occasionally. Remove from heat. Spread pizza sauce onto half the dough to within 1 inch of edges; top with 1/2 cup mozzarella, sausage mixture and remaining mozzarella. Fold dough over filling; seal edges with fork. Bake 18 to 20 min. or until golden brown. Let stand 5 min. before serving. For glossy golden-brown crusts, brush calzones with beaten whole egg or egg white before baking as directed.